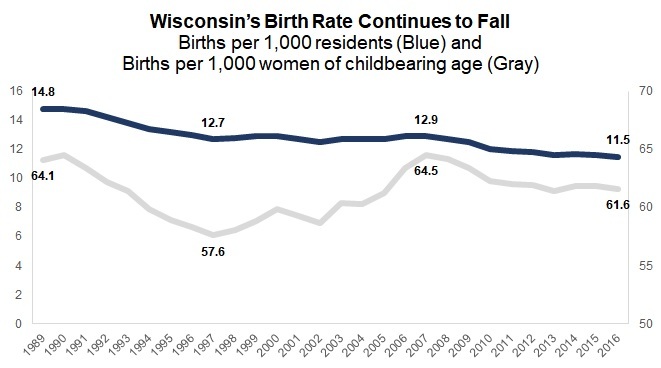 Wisconsin's birth rate has continued to fall in the decade since the Great Recession. A new analysis of state health data from the Wisconsin Policy Forum found the number of births per 1,000 people dropped from 12.9 in 2007 to 11.5 in 2016. The birth rate is now at its lowest level in nearly three decades, falling more than 22 percent since 1989. The decline is largely in line with national trends, though Wisconsin’s birth rate in 2016 was about 5 percent behind the national average. The state’s birth rate ranks 38th among other states. David Callender of the Wisconsin Policy Forum said the trend means Wisconsin's population will continue to age, which may pose challenges for the state's economy. "Wisconsin's going to need about 300,000 additional workers, just simply to keep pace with the workforce demands, by 2040," Callender said. "We're going to have to look at both the birth rate and how do we encourage in-migration, how do we get more workers into Wisconsin." Callender said economic growth tends to lead to higher birth rates. But if there is such a change, it likely won't happen immediately. Is America's Record Low Birth Rate A Cause For Concern?